This week, the screenshots released by Sakurai showed a couple of reveals, as well as a bit if comedy. 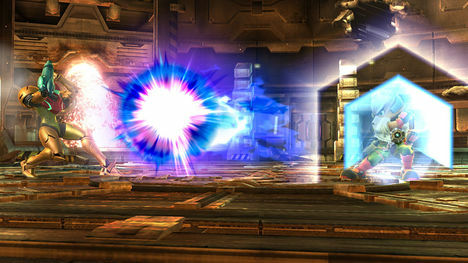 The first screenshot came along with a message by Sakurai saying that Samus’ charge shot had been modified and given extra speed and power, which, although useful at times, could be bad for her. Wait, what? That thing is being made even better? How am I supposed to dodge it now? 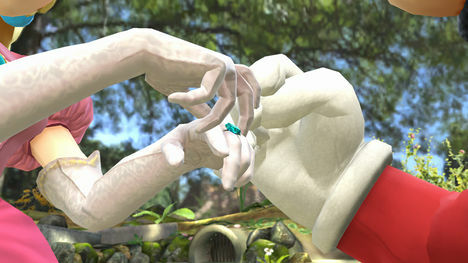 The second image was a bit more on the comedic side, with a picture of Mario “proposing” to Peach. Or maybe he’s just punching her, you never know. 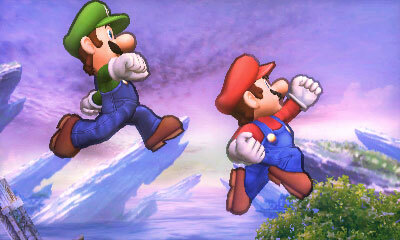 The third screenshot, from the 3DS version of the game, shows Luigi’s enhanced jumping, which makes us wonder if his classic hovering will make a debut in Smash Bros. This could be feasible as he just appeared in his own game (or should we say DLC), New Super Luigi U. 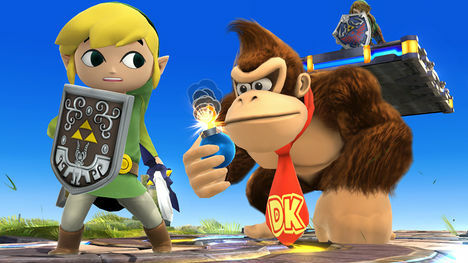 On the fourth weekday, it was announced that Toon Link would be joining the roster, being the sixteenth character to do so. 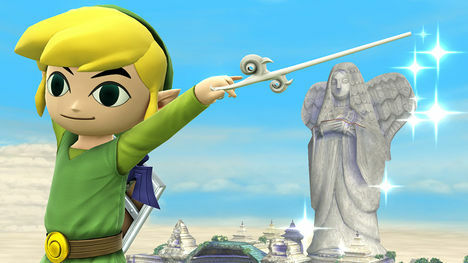 This particular screenshot shows him taunting using the Wind Waker baton on the Skyloft stage. When Toon Link was announced we weren’t sure if he would be receiving a new moveset or not, but this screenshot confirms that at least the bombs (his B + Down move) will return. From other screenshots we can see that at least the Fairy Bow and his Spin Attack have returned. That’s it for this week, make sure to come back next time to see if anything has been revealed by Sakurai. Each weekday, Masahiro Sakurai, creator of the Smash Bros. series posts a screenshot from the latest installment for Wii U & 3DS. Every weekend, we here at The Gaming Fix will recollect all of the screenshots for your viewing pleasure. 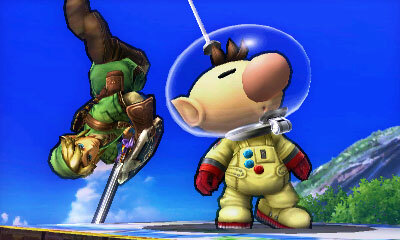 The first image is a screenshot from the 3DS version, showing how Olimar will look, and is presumably from the Battlefield stage. 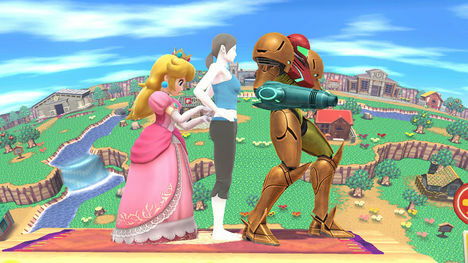 Tuesday’s image shows us all three of the confirmed female characters, with Peach having recently joined the roster. The third image is just a close up of Pyrosphere’s background, and that’s about it. 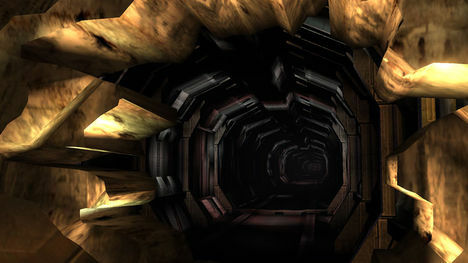 It is currently unknown if the stage will transition through this particular hole or if it’s just a background texture. 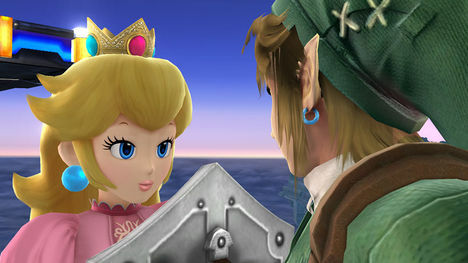 Our fourth image is just Peach sighing at Link’s sight… Is she flirting with him? That’s up to you. 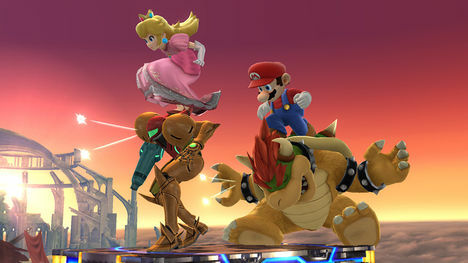 The fifth and final image shows the return of a technique that was previously introduced in Super Smash Bros. Brawl, called footstool, which involved jumping on an opponent’s head and stunning them momentarily.